I’m sitting in the Munich airport enduring the four hours before my flight to Toronto—then to Thunder Bay, where Dad and Eileen will pick me up. I have a tight connection in Toronto, so I’m not too optimistic. I’ll get home somehow, though. I wish I could trade one of these hours for one in Toronto. It’s nice to fit in here in the Munich—unlike in Istanbul where my height and fairness attract attention. 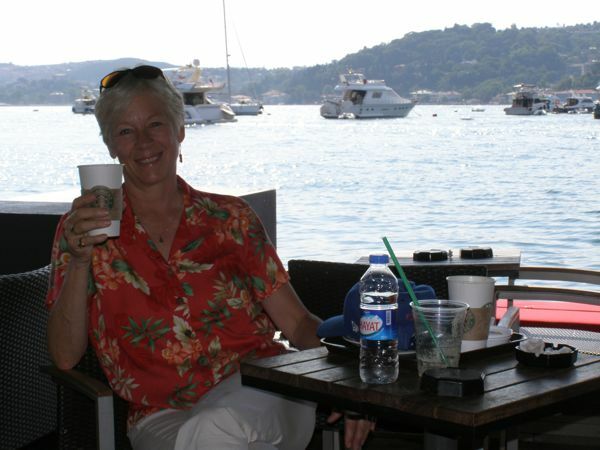 Here I’m one of many tall, light-skinned people, and there are even other gray-haired women. In Turkey all the women dye their grey hair, which I didn’t notice until it was pointed out to me by Uygar’s mother. She said, “You should grow your hair long and dye it dark so you look younger. All Turkish women do.” Hmphhh. It’s been a busy last week for me, in spite of some serious thumb-twiddling at school. 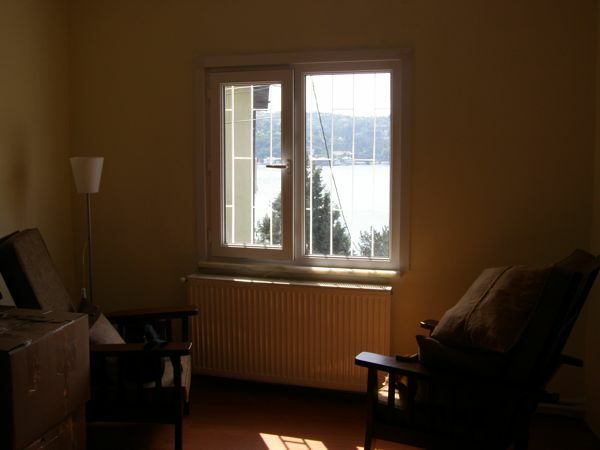 Last weekend I coaxed my friend David to load up his car with my “apartment belongings” so I could move into my new Arnavutköy digs. We left at the crack of dawn (well, actually 7AM) to beat the traffic, and it worked. It took us about a half hour to get there, which would have been nearly two hours later in the day. Robert College has already delivered some furniture, though it isn’t set up yet. It’s sort of piled at this point, but the progress is encouraging. My small three-room apartment is bright with a lovely view overlooking the Bosphorous. It sits right at the top of Arnavutköy, and I’ll have a 5-10 minute walk to school each day. Lucky me! I think I’m going to bring my bike, too. I’ve missed biking, and I hope bike along the Bosphorous early each morning morning. 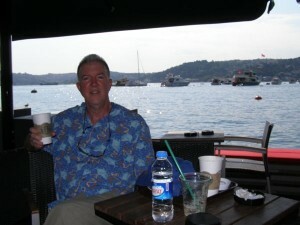 After we moved everything in, we walked up to Bebek for coffee at the most beautiful Starbuck’s in the world. We watched the C. SWEEPER in action (Sea Sweeper—get it?) Fascinating. 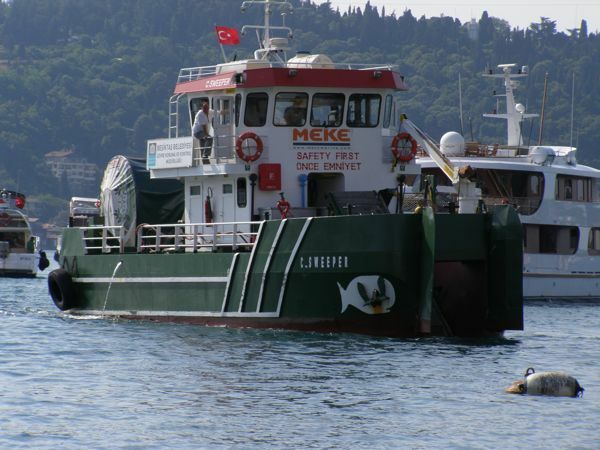 It’s a huge tug-looking boat that picks up trash from the water. One man stands on the deck directing the pilot as he maneuvers to pick up bottles, cans, and other refuse floating on the water. 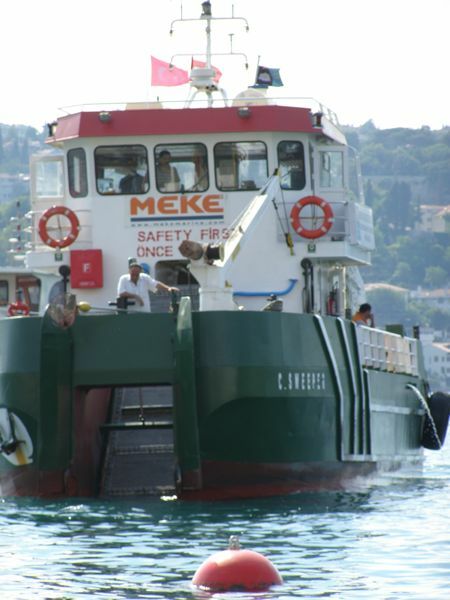 The hull of the boat is open, with a conveyor belt that lifts the garbage up to a bin on the deck. At one point, too, the deck hand used a long-handled net to pick up a bottle. It seemed like a mighty big boat for such small tasks, but maybe it also cleans up oil spills and stuff. Who knows? The “C.SWEEPER” in action–see the plastic bottle at it’s mouth? We walked back up to the apartment (a serious uphill hike), and I opted to stay behind and hike to Ortaköy to pick up earrings requested by a friend. It was just an excuse to stay in the city, actually. I’d catch the 2:45 service bus to school from Taksim. 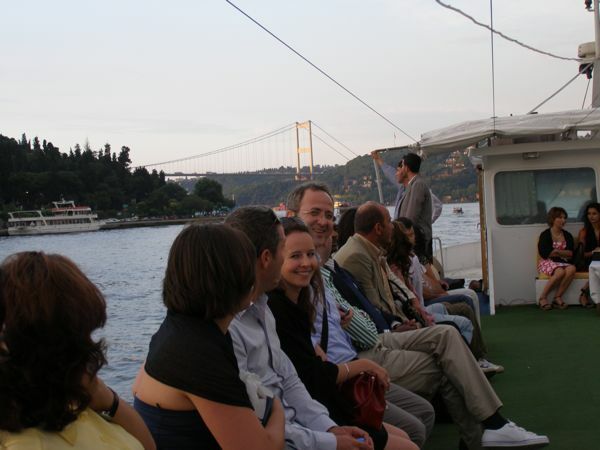 Saturday and Sunday are always busy in Ortaköy (which means “halfway town”—it’s halfway up the Bosphorous). 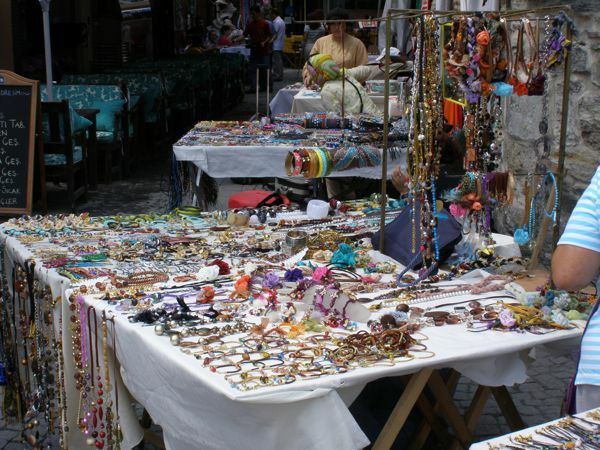 The streets and plaza down by the water are chock-a-block with jewelry, antique, and clothing vendors. It’s sort of an artsy street market. Once I found Jess’s earrings, I decided to hop on the ferry cruise for an hour (costs a whopping $5). There’s something about water that absolutely captivates me. I snapped a few more photos of things I already have scores of photos of: the Egyptian Consulate, the Rumile Castle, the Bosphorous bridge… Then after the ride I lingered over one last Turkish breakfast for the year: tomatoes, cucumbers, olives, white cheese, egg, and bread. 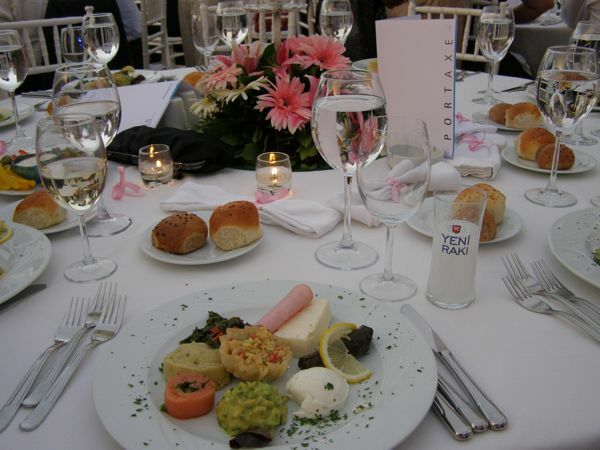 The other big event this week was the Koç School End-of-year Gala. 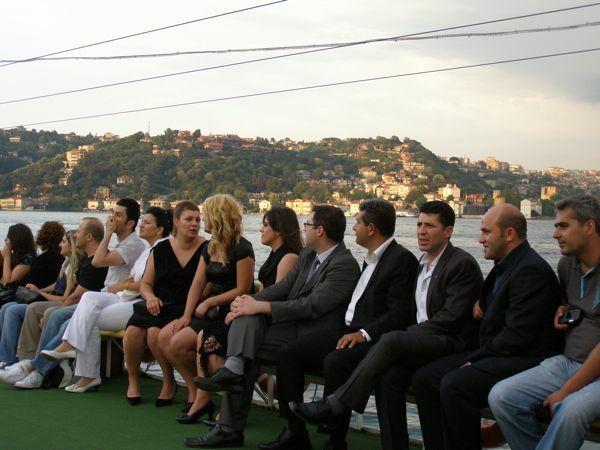 Over 500 employees were transported in big tourist coaches to the Asian side of the Bosphorous (our bus took nearly two hours), then we were ferried up to the Portaxe outdoor restaurant, where we enjoyed a lavish meal and dancing right there on the water. The clouds that threatened rain were kind to us; the evening stayed dry and warm for the festivities. The crowd was a lively one, and the dancing great fun. Turks are sociable dancers; we all laughed as Hande and Ayşe exlained the lyrics of a song about discarding husbands and how many it takes to find the right one. Pretty funny. I was astonished to realize that it was 12:30 when we were herded onto to the ferries. Once on the busses, it was a mere 30-minute ride. What a difference! Last night I finished off the year on campus by sharing a barbecue with friends. I’ll miss them, but I’m happy to be heading home again. 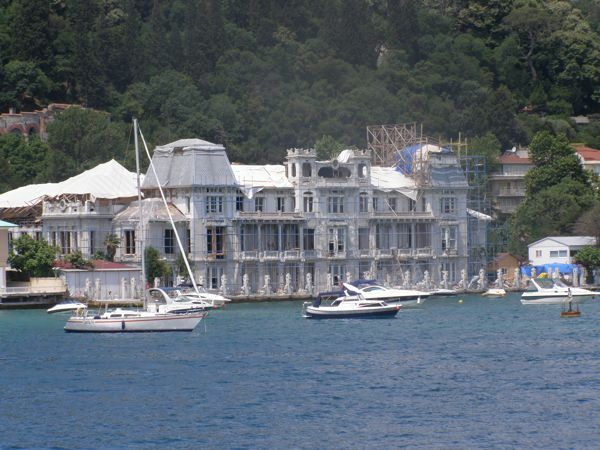 beautiful pictures of bebek, how much the coffee in tukish lira, i’m going this summer, maybe i’ll pass by! 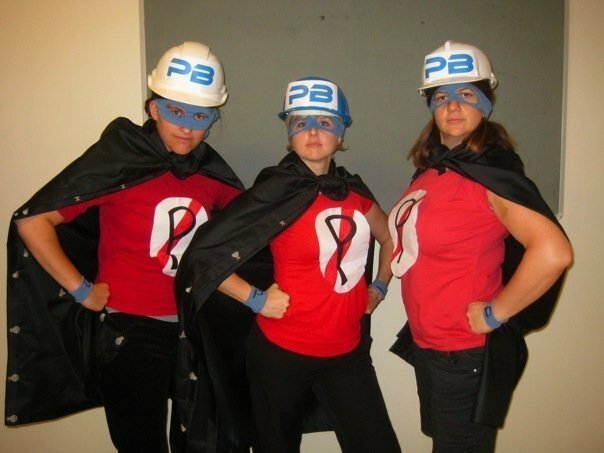 Can we use the photograph?